To clean one train, it takes 20,000 liters of water! 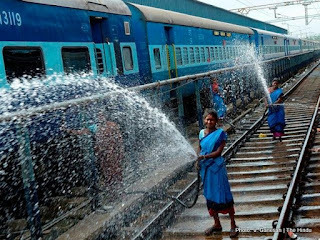 Rush Lane 2 May 2016: "Over two lakh liters of fresh water is being used every day to clean 20 trains in Chennai alone. With Indian Railways cleaning hundreds of trains every day, crores of liters of fresh water is being wasted on a daily basis. But, cleaning trains is equally important. So how to clean trains without wasting fresh water? Well, Chennai has an answer. Basin Bridge Train Care Center is supplying treated sewage water to the Chennai Central Railway Station as they embark on a new strategy to save water. Main pipelines are laid for the transportation of water while branch carries the water to all platforms. This drastically reduces the amount of fresh water being used to..." read on.